The Barrel/Drum Truck handles 30 and 55-gallon steel and fiber drums that are 24" to 48" high. Adjustable chime hook helps to secure the drum. Wheels measure 12" x 2" and are available in rubber-on-steel or polyurethane-on-steel. Capacity is 800 pounds. Specs: overall size 24 1/2" x 60" and 24 1/4" x 60 1/4". 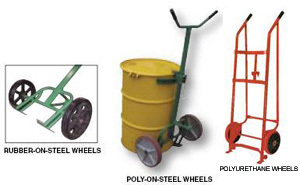 Available wheel types are Rubber- on-Steel, Poly-on-Steel and Polyurethane.